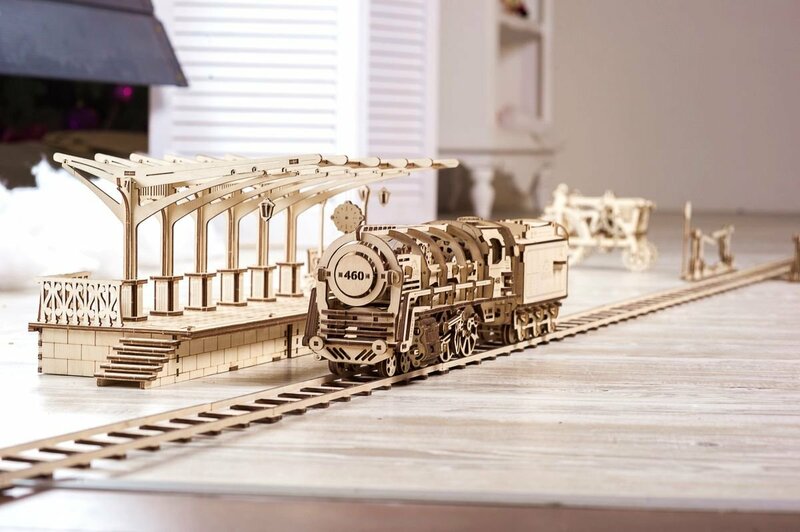 Escape from daily grind and spend quality time with family, friends, or simply by oneself working on assembly of «Locomotive with Tender» by Ugears. This mechanical model is a unique and complex433-piece assembly kit is a perfect choice for the occasion. Locomotive with Tender features a sophisticated design and impresses by an intricate self-moving motor that does not require batteries or electricity…but how?! The secret lies within Locomotive internal controls: a system of intermediate transfer sprockets and rubber-band control unit that produces movement. The model can be assembles singlehandedly or by a team, without additional tools or even a drop of glue. Get a feel of a true mechanical engineer! Simply set Locomotive in motion by turning a lever into operating position and watch it come to life chugging along your living room floor! Give a gift of unforgettable experience to you and your children. Assembly of this model takes up to 12 hours, however the time will fly by as you’ll be entirely immersed into this activity. Involve your kids and the whole family and create long-lasting memories. Set Locomotive in motion: this mechanical model produces forward and reverse movement with a turn of a lever. Choose direction: manipulate the steering wheels to allow Locomotive move upward on a arch-shaped surface. 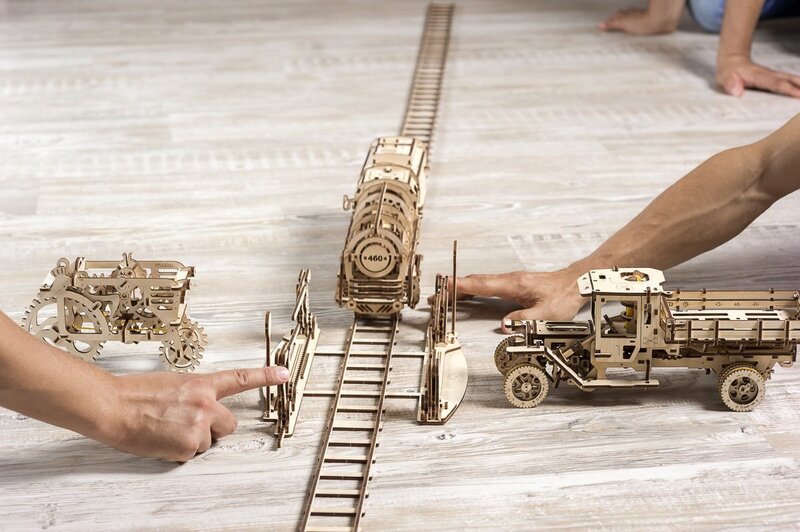 Imagine yourselves a team of real locomotive engineers, conductors and yardmasters as you play with Ugears Locomotive mechanical model. You can buy Locomotive set here. Set an atmosphere of real life railroad with additional elements available for Locomotive with Tender mechanical model: set of rails, railroad with crossing and railroad platform! 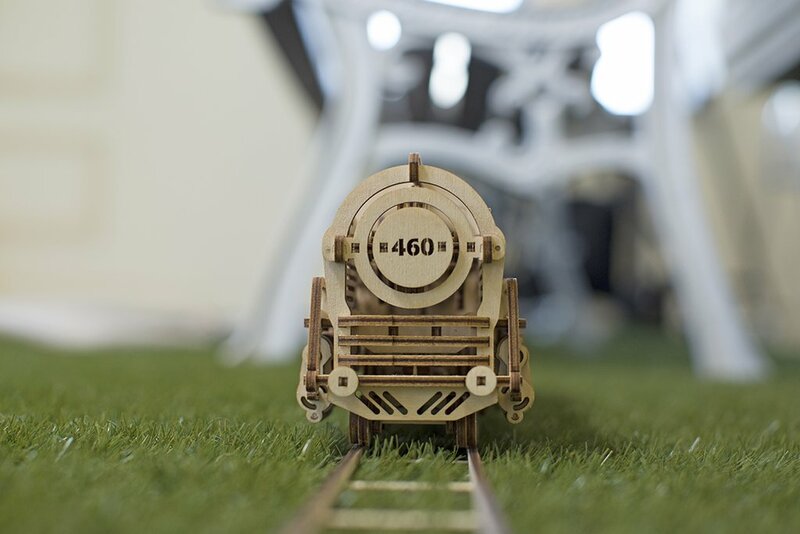 This variety of mechanical models will allow you to construct an entire retro- train station. How can you keep your child occupied on weekends? 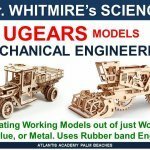 A Science teacher uses Ugears mechanical models as supplemental learning material for teaching mechanics at one of Palm Beach, FL’s high schools.